I know I'm friends with Cathadan, but I don't think I'm connected to any of the rest of the club. Cath can nominate you to be invited, then I can accept. Or you can shoot me a friend request. Thanks. I also added Dyni in addition to yourself. Level 11. Woot! I've added a few more people, but still not in the club. Sorry, haven't been on the past few days. I'll make sure to hop on tonight to add you. The division loot has sucked Dyni in. Ironic - I bought the Division and LoL sucked me in. Full disclosure: I've been unable to play much Division thanks to the wife overtaking the console for Netflix binges. Is there a way of organizing champs during champ select according to your own personal categorization? For instance, I play supports a lot, but I choose last, since I want a champ that complements my team. So I'll either choose Tank supports or Mage supports. But RIOT categorizes them differently, so I'd like to set that myself. 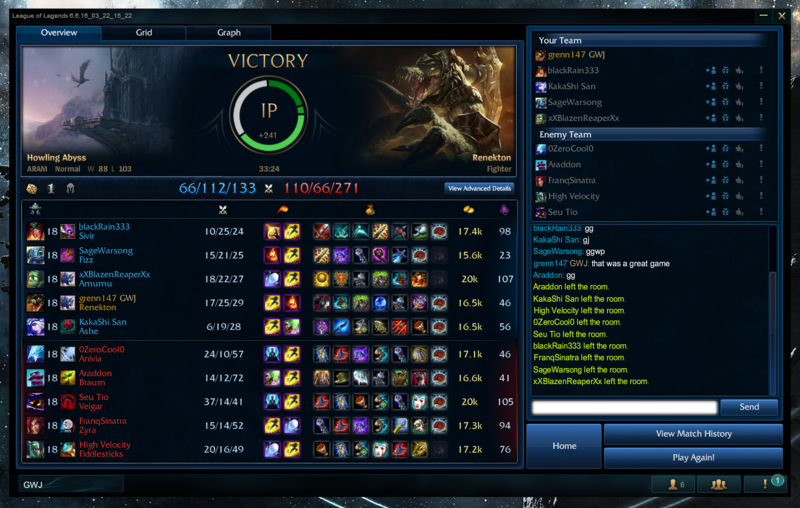 So, I just had an ARAM game that was kind of insane. Can i has club invite? 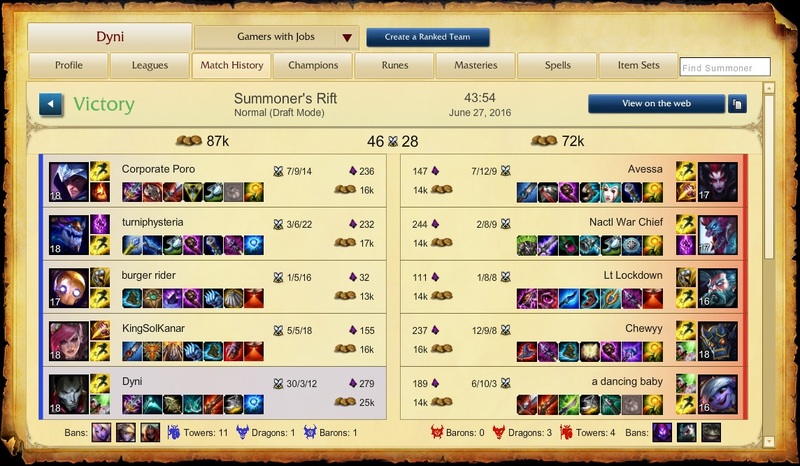 Also any folks climbing the ranked ladder on a regular basis in need of an extra adc/support? I'll shoot you an invite to the clan this evening if you haven't received one yet. Guess what I'm trying tonight! Friended you up. Can't invite you to the club until we're buds. He's very much a feast or famine character for me, but he leads to some of the most fun I've had with this game when I'm doing well. Yeah but who slowed them all for you? Also, you had just over 90% kill participation. Second highest was me with 54%. 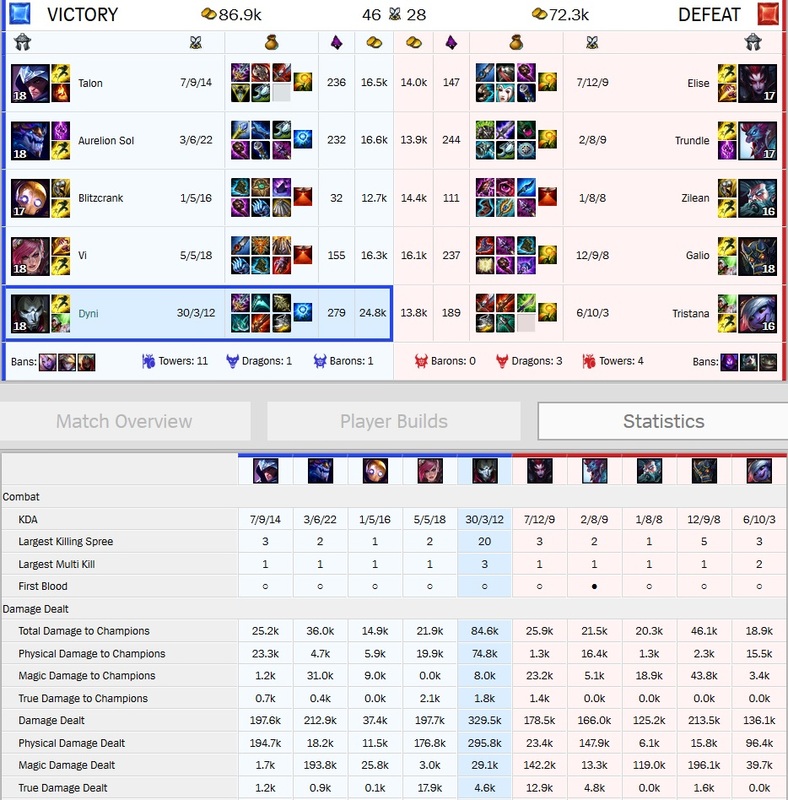 Also what's missed from that screenshot is that Galio had a 25 stack mejai's at around 25-30 mins. Is full AP Galio a thing that people do? I've always had success playing Gallio as a tanky mage. Opponents simply don't know how to counter him. I'm not a very good player, but I usually do very well with him, mostly because the opposing team is so unfamiliar with his kit. Agreed on the tanky Galio - I'd never play him full AP and Mejai's seems an odd choice. I'd play Galio full AP, I also play lots of dumb sh*t though. Also Dyni you failed to be part of 10% kills you newb. I think he's starting to get the hang of it! Just look at his progress over the course of a single game. Watching that back, I could have kited for so much longer around dragon. I just randomly ran into the Aatrox after all that dancing. First Jhin penta though, so can't complain! I am looking for a friendly team to play with on a somewhat regular basis (a couple times a week in the evenings). I have come close to giving up on Lol because so many of the experiences I have had with other players have been negative. I love the game so much, but recently the negatives have just outweighed the positives. I have grown weary of being flamed if I make a mistake, and in general the way that players treat each other is just deplorable. My hope is that I can get in with some friendly players so I can start enjoying the game again. I play support most of the time...and I am decent...not that good...but decent. I am level 30 but have not delved into ranked mode yet. I am looking for a group of players I can play with that are ok learning and growing as players...and even losing now and then. Players who can keep in view the fact that Lol is a video game that does not overrule treating other human beings with courtesy and respect. I know I already sound like a total goob...so I will go all the way....I also am looking to play with others who won't curse in the chat. I don't care for it, and also my younger sons sometimes watch me play. Any like minded players out there? This is a pretty good place for that. Even when I was a total noob people here would explain what I did wrong but not yell about it. There's a gwj curse channel where I think a lot of games form. I haven't played in a while but I see others on there in chat sometimes. Hi Archer. We can certainly offer you a group to play some friendly games with, but I would offer a few caveats. 1) The group of us that does play regularly has been doing so for many years now. We don't typically play ranked together, but the opponents we face typically hover somewhere between high gold and low diamond. Though you didn't explicitly say so, your comments above suggest that you are a relatively new level 30 player. If so, you may initially find yourself a bit overwhelmed playing with us. On one hand, playing against better opponents will help you to improve much more quickly than you would normally, but we have played with other new players in the past that have become frustrated quickly by the increase in opponent skill when they queue up with our group. This is just something to be aware of going in. If you are open to constructive criticism and eager to learn, you will improve much more quickly playing with us than on your own. If you tend to get easily frustrated, you might not have a great time. Of course, all of this is assuming that you are a newer player. If not, ignore this section Also worth noting: the fact that your preferred role is part of a duo lane makes this factor less significant than if you were playing a solo lane. Your ADC should be able to pick up some of the slack and help you find your way in lane. 2) I think our group does a good job with everything you mentioned, but I'd be lying if I said that there wasn't occasional venting of frustrations and small squabbles about what went wrong. This is a competitive game, and some nights are frustrating because getting stomped multiple games in a row isn't much fun for anyone. 3) We are pretty much always on voice chat when we play, and we do curse sometimes. I can censor myself pretty easily, but I can't speak for everyone. If this is enough to put you off, you might not want to be on voice with us. I can pretty safely assure that there is typically no cursing in chat on screen from our team. We have been pretty bad about using that channel lately. We typically just start up private calls. It'd probably be good to get in the habit of using that again in case anyone else does want to join. Archer, send me a friend request in game. We'll get you in the GWJ clan if you're not already in. "If you are open to constructive criticism and eager to learn, you will improve much more quickly playing with us than on your own. If you tend to get easily frustrated, you might not have a great time. " This sounds like what I am looking for. I will add you on League and look forward to playing with some of the GWJ clan! I've seen you on a few times, but we've either had full groups going, or you've been in games on your own. Feel free to send me a message when you see me on if you're looking to group up.